32 people were hurt when one bus rear-ended the other. Erica Byfield reports. 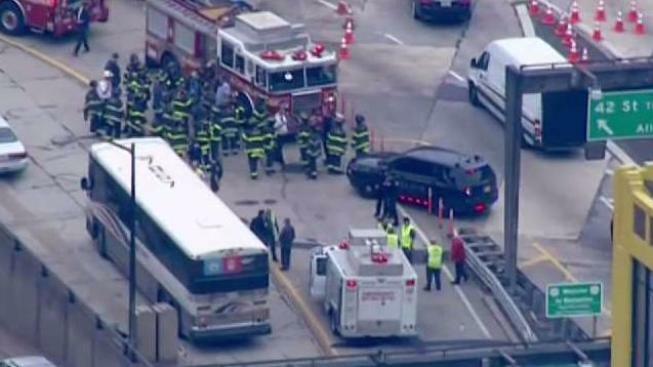 Thirty-two people were hurt when two buses collided at the Manhattan-side entrance of the center tube of the Lincoln Tunnel Friday, an accident that sent all but one of the dozens of victims to the hospital, FDNY officials said. Port Authority says that one NJ Transit bus rear-ended another in the center tube just before 10 a.m. Eight of the 32 victims had serious injuries, but those were not believed to be life-threatening and the other injuries were minor. FDNY says that 23 of those injured were transported to Bellevue Hospital, while the eight victims with serious injuries were taken to Lenox Hill and Mount Sinai. Stephen Russo, FDNY deputy chief for EMS, said that the department used a specialized bus to transport dozens of injured victims at a time to local hospitals in order to not use all the ambulances in the area due to the high number of injuries reported. The accident happened at the entrance to the center tube. According to NJ Transit, both buses originated out of New Jersey — one out of Wayne, the other out of Oradell. One of the buses had 25 passengers on board, while there were 37 on board the other. The buses are currently out of the tunnel and on the New York side, NJ Transit says. Port Authority Police Department is investigating the incident, but says the Lincoln Tunnel is fully operational. "We're going to conduct investigation which involves reviewing video tape and speaking and taking statements from the drivers and rest of patients," Raymond Bryant, the deputy chief for the Port Authority Police, said.